Those who know me, know I love a good cupcake. A fan of these little delights long before the "cupcake craze" hit, I preferred these hand held desserts to their larger counterparts. And while I enjoy making cupcakes (and my friends enjoy eating them), I have been on a quest to find the nation's best cupcake during my debate travels. So far I have had cupcakes in Northern and Southern California, Utah, New York, Nevada, Texas, Alabama, North Carolina, Colorado, Illinois, Massachusetts, Minnesota and Nebraska (possibly some other states... but I am drawing a blank on those if I have). This weekend a colleague who has been reading my blog for awhile asked why I never featured these cupcake adventures on Uncovering Food. My response was that cupcakes are exactly a healthy food. Her response? A portion sized dessert made with real ingredients is healthier than most of the things people eat. She is right! And while I might not be able to recap all of my cupcake adventures, I will try my best to chronicle them starting with this weekend! 1. Cake: Is the cake moist? Is it flavorful? Fresh? 2. Frosting: Is the frosting consistency good? Appropriate sweetness levels? Compliments the cake? 3. Overall: Is the frosting to cake ratio appropriate? Overall appearance? So how did Jones Bros stack up to their competition? The cake was moist but did not hold well. It began to crumble after the first bite. The flavor of the cake was overpowered by the overly sweet cream cheese frosting. I love a sweet frosting, but the cake has to stand up to it in order for the frosting to be pulled off. The cake to frosting ratio was great, as you didn't run out of one before the other. And while the overall appearance of the cupcake was pretty enough for pictures (and I took lots of them), the cupcake was average when it came to overall dessert-ability. While the Red Velvet was not the best I ever had, for the most part, my companions enjoyed their cupcakes. 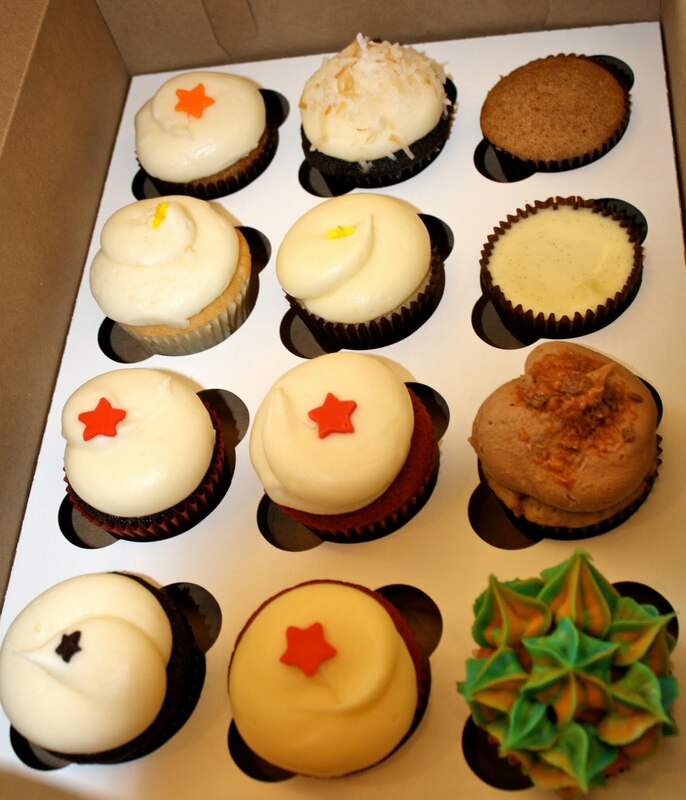 Check out the "Wild Thing" cupcake in the right-hand bottom corner of the box! It was a multi-colored buttermilk cupcake with colorful frosting spikes. But I am on the hunt for America's BEST cupcake shop! * Hey Tab folks... check out how awesome those Hilton boardroom desk pads made that cupcake photo turn out! Oh! 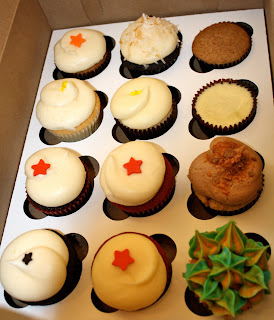 The cupcakes are so cute...and thanks for the review. Nice pictures! this is a great idea! I would love to tune in to find the results of this quest... 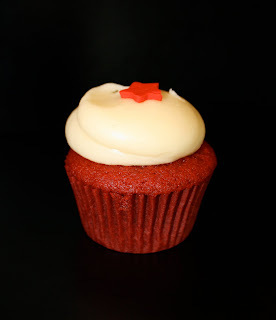 I am still madly in love with the red velvet from Magnolia... and I hate magnolia.. but their red velvet rocked my socks off. A fun quest! Looking forward to more cupcake reviews! I live not far and decided to stop in last night. I was disappointed for the price that I paid (3.95 each) in the quality, taste and size. I've actually had better red velvet from HyVee Grocery store. Won't be going back soon. I was treated very rudely by their cashier when inquiring about ordering dozens of their mini cupcakes for my clients for the holidays. I unfortunately ordered anyway for a couple of the firms I work for intending to order more over the week and gift cards as well. 6 dozen of their mini cupcakes cost over $100. I was okay with that but the cashier overcharged me and was rude when I challenged her. Then she didn't even say "thank you" when I left. Won't be going back there, and, in fact, just ordered eight dozen FULL SIZE gormet cupcakes from the Cake Gallery for $135 and $200 worth of gift cards from Panera for individual clients. J.B missed out on $335 sale. I got scr**wed by J.B. Won't go back, don't recommend the place. I like to support new Omaha businesses but got burned this time. Next time you're in Omaha, venture out near 120th & Blondo and try Cupcake Island. Their hours aren't as convenient and no place to "eat in," but the cupcakes are less expensive and, in my personal taste comparisons, better.